1. Hair Conditioner. Apply to damp hair, then massage into your scalp and hair. Comb your hair to distribute the oil evenly. Put a shower cap on, tuck your hair inside, and leave the coconut oil on for at least 30 minutes. Shampoo your hair and rinse with warm water. 2. Hair Shine. 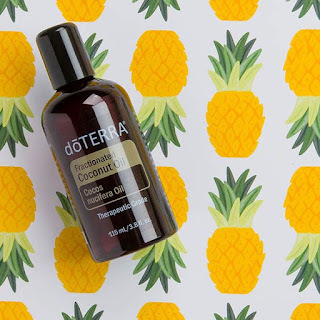 Put a few drops on the palm of your hand and apply it lightly throughout your hair. 3. Makeup Remover. Apply a few drops on a cotton ball, Q-tip, or facial pad. 4. Foot Care. Mix with Lavender essential oil and massage into your heels and feet. 7. Massage Therapy. Use it in aromatherapy massages and the AromaTouch® Technique. 8. Essential Oil Uses. Dilute essential oil in topical application on young or sensitive skin. 9. Leather Conditioner. Apply on a clean cloth and rub it onto leather furniture for a new and clean look. Combine all ingredients in container and apply small amount on microfiber cloth to dust or polish wood surface. 11. Paint Brush Cleaner. Combine with Lemon essential oil and soak your paint brush to remove oil-based paint. 12. Makeup Brush Cleaner. Combine with Melaleuca (Tea Tree) or Lemon essential oils to clean makeup brushes. 13. Plant Revitalizer. Use to add shine to your artificial or real plant leaves. 14. Car Dashboard Cleaner. Use a rag to give your car’s dashboard an instant shine. 15. Crayon Remover. Rub it on the crayon marks, let it soak for 10 minutes, then clean with a cloth. Fractionated Coconut is yours for free (Australia/New Zealand) if you place your Loyalty Rewards Order before the 15th of February and it is of 125PV or more. Ask me if you have questions (using the contact form on the left hand side of the main page)! I'm happy to help and would love to welcome you in our doTERRA family.